So you have spent several months researching the breed and the registered breeder suited to your family. You’ve gone to pick up your puppy and now you’ve brought the puppy home… what next? 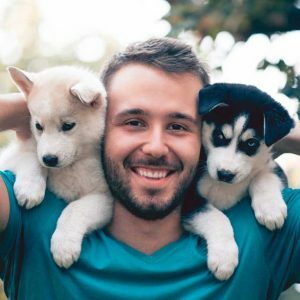 Do your research on obedience training schools, and enrol as soon as possible while your puppy is still in their critical period of development. Do your own research on a species-appropriate diet, refer to The Balanced Canine for information regarding the nutritional value of various dry foods and raw food. Book a private consult with a trainer to ensure you set your puppy off to the right start, by developing a socialisation plan, training plan and addressing any questions and concerns you have. However, when raising a puppy, management is a key factor in developing the balanced family pet everyone aims for. When raising puppies it is important that we manage them properly in order to set them up to succeed and ensure they learn and rehearse desirable behaviours. This in combination with obedience training and appropriate stimulation ultimately prevents the development of problem behaviours such as barking, jumping, attention seeking behaviours, separation anxiety, OCD behaviours, destructive behaviours etc. Therefore, having a suitable set up from the day you bring your puppy home, is essential. This includes a sturdy and secure play pen, a crate, frequent access to outside to toilet, appropriate chews and toys, and a light lead and collar for when roaming the house. Of course teaching a reliable level of obedience training is essential as well, but please refer to our blog “Obedience Training, Why Bother?” for further information on this. Whenever you are unable to supervise your puppy for more than 30 seconds, he needs to be secured in a playpen or in the yard. Yes this includes times like going to the bathroom, having a quick shower or getting the mail. If puppies have too much freedom and access to the entire house, they are likely to find inappropriate ways to amuse themselves. If we are not there to prevent them from doing this, they are ultimately likely to find it self-rewarding as they generally have a good time chewing things, foraging in the bin etc. Additionally, if your puppy has too much freedom and lack of supervision you are not there to give the puppy feedback for the behaviours he is offering and therefore you cannot teach him how he is expected to behave. In the playpen your puppy cannot get up to any mischief or practice any undesirable behaviours. Remember practice makes perfect and therefore the more opportunity your puppy has to make mistakes and chew things he shouldn’t, steal food from the coffee table, toilet where he shouldn’t and jump on the couch, the more these behaviours will become imbedded and learned to be normal. and either access to outside or a small area of fake grass for accidents. It is important that the area the pen in kept on, is a hard surface and therefore accidents are more effectively cleaned, discouraging inadvertently teaching the puppy to toilet in the house. Please do not include any puppy training pee pads as these will teach your puppy to seek out soft mats, rugs, carpet and bath towels to toilet on. The play pen should certainly not be used as a punishment or time out area, but instead as a secure place to keep your puppy when he cannot be supervised. We are strong advocates for crate training for numerous reasons: they provide a safe, secure and non-obtrusive place for your puppy to switch off and sleep, they prevent undesirable behaviours such as barking overnight and jumping on the benches to steal food when everyone is asleep, they help to settle and relax an excitable dog or an anxious dog and they are a secure and comforting place to keep your dog when travelling. When first beginning crate training it is essential that the dog isn’t forced into the crate to panic until exhausted. Crate training should be taught gradually so they dog becomes conditioned to feel relaxed and settled in his crate. 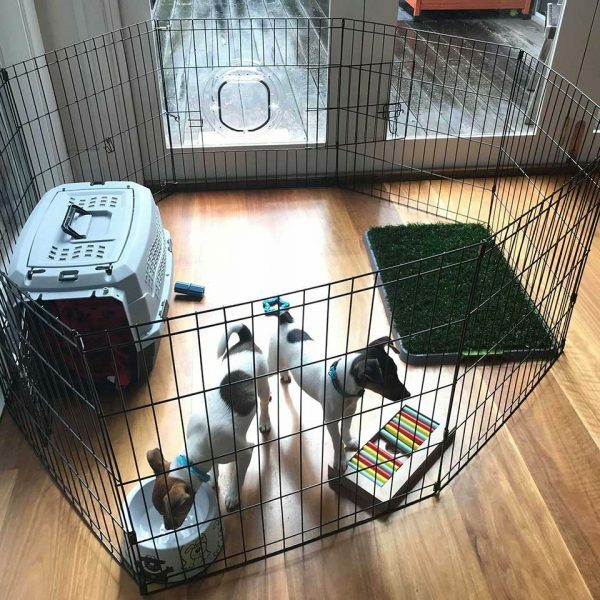 The ideal way is to have the crate open in the play pen for the first week or two of the dog being in the home. 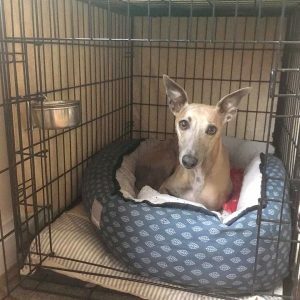 Make the crate appealing to be in by placing a dark blanket or cover over the top, leaving one end open, placing a comfortable bed inside with a toy or chew. Position the open end of the crate outwards so the puppy can still see what is happening in the house. The only bedding in the play pen should be in the crate so the puppy chooses to go inside and rest as it will be the most comfortable place to be. I simply allow my puppy to go in and out as he pleases, sleeping inside whenever he feels like it, for the first week or so. You can also give the puppy chews, kongs, and some of their meals in the crate to help build a positive association. Simultaneously I teach the puppy to sit at the gate in order to be let out of the playpen area; this helps to prevent scratching, jumping and barking in order to be let out and teaches the puppy to just wait patiently and calmly. Once the puppy has spent some time enjoying his crate and building a positive and relaxed association, I place him in the crate with a chew in the evening after he has toileted and when the house is quiet. Then I leave him there to sleep for the night, now with the door closed. It is normal for the puppy to whine a little on and off for the first few nights as he becomes accustomed to the new routine, but as he already has a good history with the crate it shouldn’t take long for him to settle. Your puppy is likely to be unable to hold on throughout the night and you do not want him having an accident and toileting in his crate. Therefore you will need to take him out once or twice throughout the night to toilet outside. Make sure you choose to do this when the puppy is not whining but when he is quiet and settled, or he will rely on whining in the crate to be let out and to get up in the morning. He should learn to relax and wait patiently to be let out (this also means later down the track you can have sleep in’s without the dog waking you up). This requires you to set the alarm at 3- 4 hourly intervals (depending on the puppy) so your puppy is not busting to toilet by the time you let him out. Eventually you can extend the time he is in the crate and he will learn to hold on and wait patiently for you to let him out. As mentioned above, it is essential that your puppy is supervised whenever free in the home. However, this is easiest if the doors are closed or baby gates used to keep the puppy in the same room as you. Additionally, during an in-home consultation our trainers will teach you to train your puppy to reliably come when called and to respond to its name, and this exercise should be utilised in the home to keep your puppy close by. Further to this, when your puppy is wandering in the home a small thin puppy lead and collar should be kept on. It depends on the circumstance as to whether you hold the leash or allow it to drag around. However, please cut the loop off for safety so your puppy does not get caught. 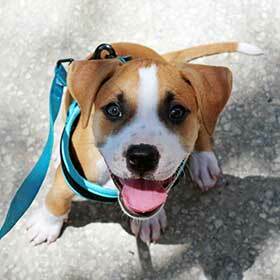 Also, when first allowing the puppy to drag the leash, give him a chew to prevent him from chewing on the leash. The leash ensures that you can always prevent your puppy from practicing undesirable behaviours. For instance, when the doorbell rings you want your puppy to learn to go to his bed and stay there. Again, at an in-home consultation our trainers will show you how to teach your puppy this skill. If the leash is on, when the doorbell rings, you can pick it up and send the puppy to his bed. The leash gives you the control to show him this is the behaviour required and also prevents him from learning the pattern of running, barking and jumping at guests at the door. Another example – your children are running around the house; rather than allowing your puppy to learn to chase and jump on them, you pick up the leash and remove the puppy to outside or the play pen, or practice some calm obedience such as a sit, down or bed training. Your puppy is about to chew the leg of the coffee table – you use the leash and your recall to guide the puppy away and encourage him to chew something else. Additionally, the leash can be used to teach puppies boundaries such as keeping out of the kitchen, not bolting through doors and keeping out of certain rooms. The idea of the leash in the home is to the puppy from rehearsing undesirable behaviours and to calmly guide and show the puppy what is expected of him. All this is done with minimal conflict instead of grabbing the collar, yelling no and chasing the puppy as he’s stolen your sock and so on. We often see people whose dogs are always desperate to get inside when put in the yard. It is important that you teach your puppy from the beginning that outside is a fun place to be. 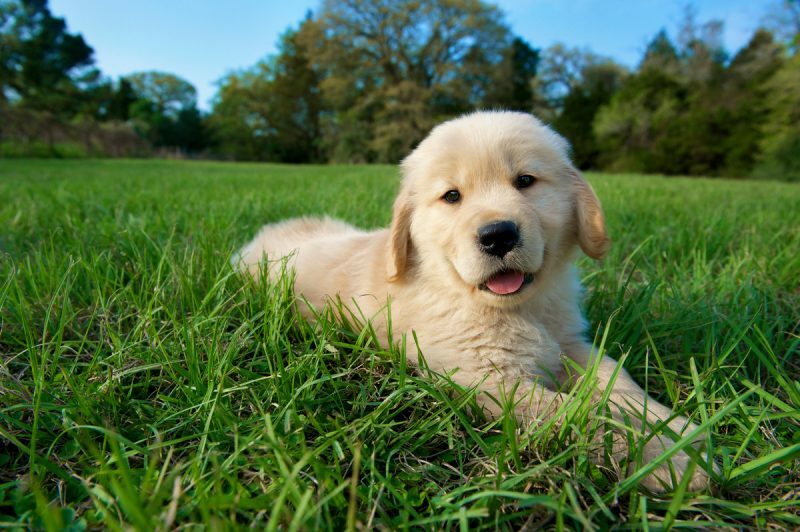 Start by scatter feeding your puppy’s meals through the lawn, practicing your obedience training outside, playing outside and generally just spending time with your puppy outside. The yard should always been seen as an enjoyable and even an exciting place to be, whilst inside is a calm and relaxing place to be. 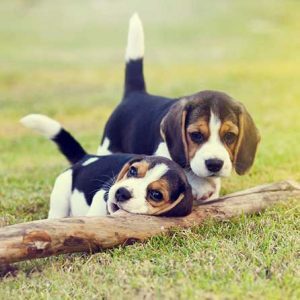 It is normal for puppies to explore their environment and investigate everything with their mouths, and although this isn’t necessarily ideal inside, allowing your puppies to do this outside is needed to simply let them be dogs. This also helps significantly with toilet training and preventing separation anxiety if your dog enjoys spending time in their yard. So now that you have your set up, how do you apply these tools to raise a well-mannered family pet? Firstly, do not expect too much too soon. I wouldn’t expect to leave a dog unsupervised and free roaming the house until approximately 18 months old, or more accurately until I can guarantee 99% that they will not attempt to do any undesirable behaviours. 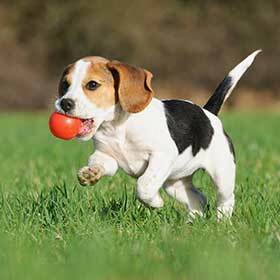 Next, develop a routine: in the morning the puppy is taken outside, goes to the toilet, has a calm hello with the owner, fed breakfast by scatter feeding in the yard or through obedience training, has a play, hangs out inside for a while, ready for a nap again in the play pen and repeat. Ideally, the puppy would be put in the playpen 2 hourly or so for naps and to relax, taken outside frequently to toilet and play, and intermittently in the house on lead practicing calm behaviour. It is normal for puppies to have crazy times where they sometimes seem possessed! This is normal and okay, just ensure your puppies rehearse these crazy zoomies outside, not up and down your hallway, or rebounding off your couch! The puppy should always have access to a chew and 2-3 toys. I suggest having 10 or so and rotating these daily to ensure they are novel to the puppy. Most importantly, please make it very clear to the puppy when they have done the right thing so that the puppy begins to default to these behaviours. If you are praising your puppy for calm behaviours, please do this in a calm manner with long calm body pats or massage, if you are playing with your puppy please heavily praise them for biting the toy and not your hands for instance. Lastly, it is important that the whole family is aware of the rules, management and structure for the puppy in the home, and that everyone is consistent with maintaining this. Management is a huge component of raising a puppy, however socialisation, obedience training and physical and mental stimulation also play important roles.